Adventures in Fake Meat: Head to Head, #3 - Meatballs! Head to Head, #3 - Meatballs! The poll I posted actually came out a three-way tie, so I'll be reviewing the three winners over the next few weeks. I cast the tie-breaking vote, because I was in the mood for meatballs. In any case, here comes the next head-to-head review! This week, I'm pitting Trader Joe's Meatless Meatballs up against No Name Original Meatballs. I figured it would be more fair to compare two brands of frozen meatballs than for me to make homemade meatballs. I dumped both packages into a pan, and compared. They both looked pretty good. I fried the meatballs in a little olive oil first, as directed, then poured spaghetti sauce over both of them to heat up. The Trader Joe's meatless balls said they'd take about 10 minutes, but I think that was the time estimate for putting the meatless balls into already-hot sauce. Those things took forever to heat up! But that was just as well, because the spaghetti squash I was going to eat them with was taking extra time as well. Side note, if you've never had spaghetti squash before, you should definitely check it out. I usually cut them in half, scoop out the seeds, cover them with a light coat of olive oil, sprinkle with salt and pepper (and usually garlic powder), and bake at 350 degrees for roughly 45 minutes. Sometimes it takes a little longer - just scrape the flesh lightly with a fork to check - if it's done, it'll come off in little spaghetti-looking strands without too much effort. Then just scrape it all out onto your plate and top with whatever you like on your spaghetti. Delicious! Okay - now that the meatballs were all hot and yummy looking, it was time to eat them. I put a few of each type onto my plate, and took a bite of the meatless ball first. (sorry - no blind taste test for me) It had that distinctly gluten-y flavor I've come to recognize in many fake meat products. It's not a flavor I really enjoy. I ate the rest of the meatless balls, and they did get better after the first bite, as I grew accustomed to the flavor. The texture, however, merits a special comment. The texture of these meatless balls is very similar to homemade meatballs. At least the ones I make, anyway. Very nice texture, although a little bit fragile. They started to fall apart a bit in the sauce as I was stirring them, even though I was trying to be gentle with them. 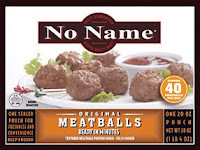 Now let's talk No Name's real meatballs. I've had these before, and they were pretty good at the time. After eating a bunch of meatless balls, though, I admit they tasted a little weird at first. Not like, "I forgot what meat tastes like" weird. Just a little weird. Probably the frozen pre-made meatball factor. In any case, After the first bite, things normalized, and they were the tasty meatballs I remembered. Oddly, though, after the homemade texture of the meatless balls, I found myself kind of let down by the texture of the real meat meatballs. They were pretty tough and chewy. Without the direct comparison with the meatless balls, I'm sure it wouldn't have been as big a deal, but it was kind of a bummer. Both of these had good points and bad points. Honestly, if I could combine the flavor of the real meat meatballs with the texture of the meatless meatballs, we'd really have something. Oh wait - that's my meatballs from scratch. Man, I make some good meatballs.